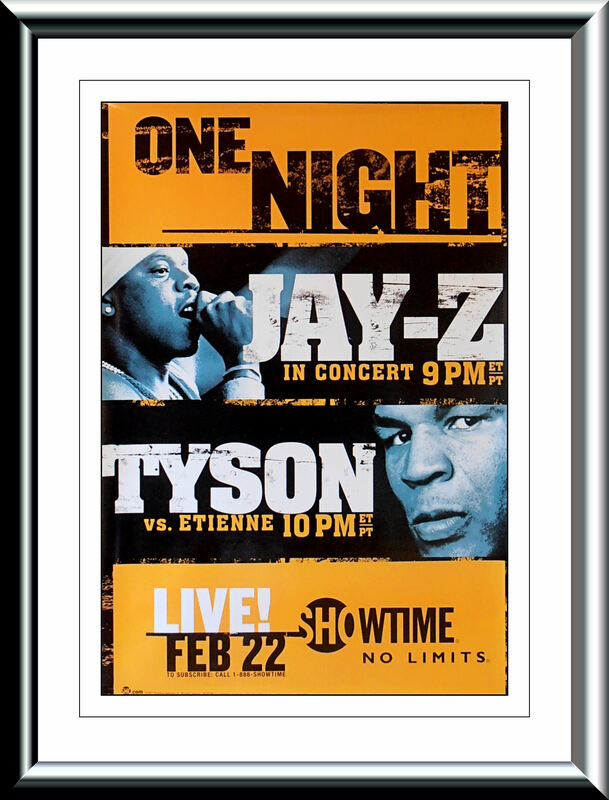 Description : Here we have the super rare official & original SHOWTIME boxing Pay Per View poster for the February 22, 2003 bout where Tyson beat fringe contender Clifford Etienne 49 seconds into round one. The pre-fight was marred by rumors of Tyson's lack of fitness. It was said that he took time out from training to party in Las Vegas and get a new facial tattoo......Despite concerns about Tyson's condition, the fight would prove to be one of his quickest victories. Tyson would start the match aggressively by throwing powerful combinations at Etienne, causing Etienne to clinch with Tyson, though the combined momentum of the two fighters caused both men to stumble to the mat and he referee then called a brief timeout to allow the fighters to regroup from the fall. After the fight was resumed, Tyson continued to throw wild power punches at Etienne, though none connected. 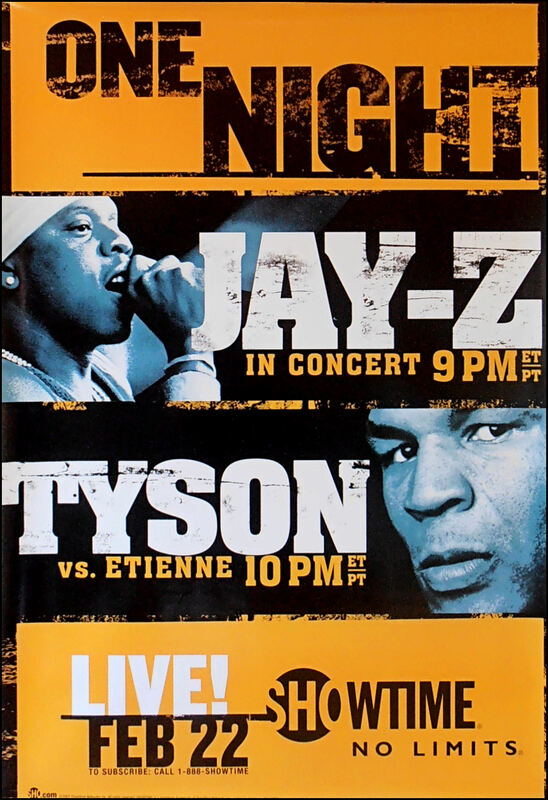 Etienne responded by throwing several power punches of his own which caused Tyson to clinch. After being separated, Etienne missed Tyson with a left jab & right hand combination. Tyson then missed with a left hook, but rebounded with a strong right hand that sent Etienne down. Etienne laid flat on his back and made no attempt to get back up as the referee counted him out. Tyson was then awarded the knockout victory at 49 seconds of the first round. 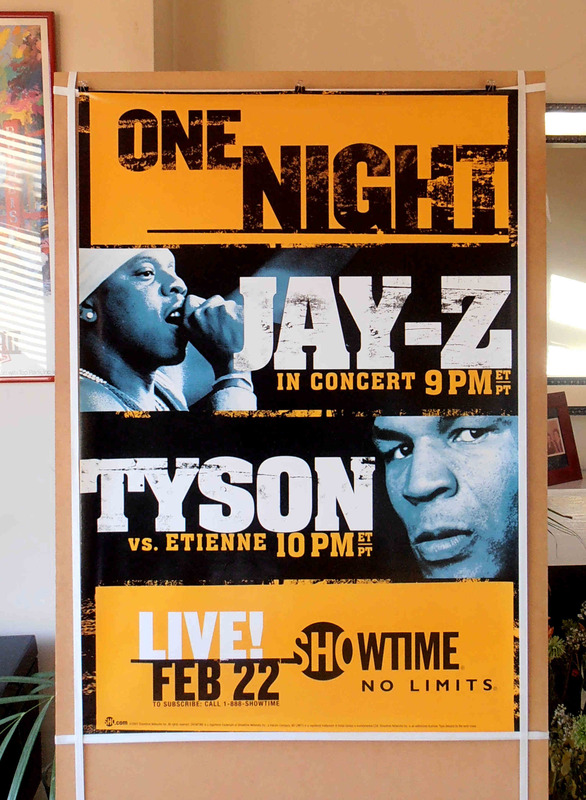 The victory would be the 50th and final one of Tyson's professional career.....These SHOWTIME boxing pay per view posters were not available for public consumption & were only available from contributing PPV outlets hence the scarcity.